For anyone that ever wants to doubt that the Utah Jazz have what it takes needs to watch some film from last season’s team. After losing small forward Gordon Hayward in free agency, the Jazz were expected to take a step back, but what ensued was a season where they became one of the top teams in the Western Conference. The Jazz would win 48 games en route to finishing fifth in the Western Conference, while they were also able to defeat the Oklahoma City Thunder in the first round of the playoffs. And Utah’s foray into the postseason showed that the future is bright for this franchise that calls Salt Lake City home. A big reason for last season’s success for the Jazz was the emergence of shooting guard Donovan Mitchell. Mitchell came out of nowhere to average 20.5 points per game as he barely missed out on being named as the NBA’s Rookie of the Year. Mitchell has the ability to create his own shot by getting to the basket, or as a perimeter shooter. Mitchell is a “combo guard” who can do a little bit of everything and his scrappiness falls right in line with the philosophy of Jazz head coach Quin Snyder. Last season the Jazz were one of two teams in the NBA that didn’t surrender at least 100 points per game. And Utah’s commitment at the defensive end of the floor begins with the play of center Rudy Gobert. Gobert is the reigning NBA Defensive Player of the Year due to his prowess in the paint. Gobert has averaged 2.2 blocks per game. Gobert is 7’1″, but his wingspan makes him 7’9″, and he is also a leaper. However Gobert did miss 26 games last season for the Jazz, and if he is able to be healthy this season, it will only improve Utah’s chances to be one of the top teams in the Western Conference. In 2010, the New Jersey Nets made power forward Derrick Favors the third overall pick of the NBA Draft, but they would give up on him after less than a season. Favors has settled in with the Jazz to be a good rebounder as well as a defensive presence on the interior. At 6’10”, Favors has a substantial wingspan as he and Gobert in the paint on defense make it tough for opposing offenses to score. In six seasons with the Minnesota Timberwolves, point guard Ricky Rubio was a forgotten player due to the fact that he was on a team that didn’t make the playoffs. But a trade to the Jazz allowed Rubio to play off of Mitchell and give the Jazz a solid backcourt. Rubio gives Utah another ball handler, and his ability in the open floor could lead to many fast break opportunities for Utah. Last season the Jazz entered the playoffs with six players who averaged at least 11.5 points per season. Snyder preaches sharing the wealth on offense and with likes of small forwards Jae Crowder and Joe Ingles boosting the scoring, the Jazz will once again be a problem for many teams in the Western Conference. Two of Utah’s first four games this season will be against the Golden State Warriors and Houston Rockets, but make no mistake about it that this team has what it takes to hang with the top teams in the Western Conference. The best way to describe the Denver Nuggets is that they have suffered some hard luck. The Nuggets won 46 games last season, but a loss to the Minnesota Timberwolves in their final game of the regular season sent the Timberwolves to the playoffs, while Denver headed home. In each of the last four years the Nuggets win total has increased as they continue to build and develop under head coach Michael Malone, and hopefully the upcoming NBA season will see Denver make their first postseason appearance since 2013. 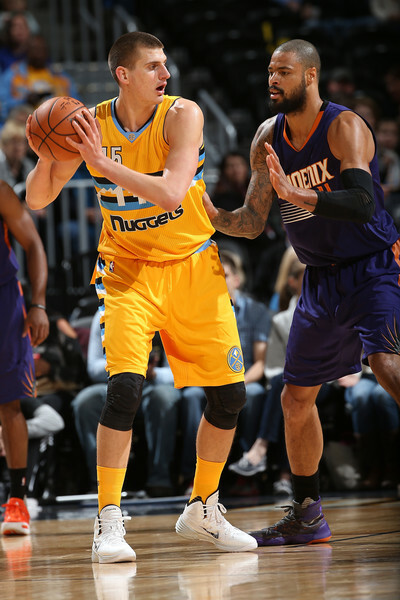 Any chances for the Nuggets to be a contender in the Western Conference begins with the play of Nikola Jokic. In three years in the NBA, Jokic has developed into one of the better big men in the game which is reflected by the fact that his production has consistently increased. Last season Jokic averaged 18.5 points per game to go along with 10.7 rebounds, 6.1 assists, and 1.2 steals. Jokic also connected on nearly 40% of his three-point shots last season as his overall production led to the Nuggets giving him a five-year extension this past summer for $148 million. Dokic is only 23-years of age, and as his output on the court will only get better, he should be in line to make his first All-Star Game appearance this season. Along with Jokic in the frontcourt, the Nuggets are hopeful to have a healthy Paul Millsap at power forward this season. In Millsap’s first season in Denver, he missed 44 games due to injury. However when Millsap is healthy, you’re talking about one of the better post players in the Western Conference as I can see the Nuggets running a ton of high-low sets between he and Jokic. In 2016, the Nuggets used a first-round pick on point guard Jamal Murray, and it has not taken him that long to come into his own. Murray averaged 16.7 points per game last season which was third on the Nuggets. Murray continues to improve on his scoring, but if he can become a floor general for Malone this season, this Nuggets team will be a force to be reckoned with. Shooting guard Gary Harris has four years of experience under his belt with the Nuggets, and like Jokic and Murray, he continues to improve. Harris is coming off of a career year where he averaged 17.5 points per contest which led to him getting a four-year contract extension for $84 million. Harris’ ability to get to the basket as well as his improving perimeter game makes him the perfect backcourt player to run with Murray as this will be a very formidable duo this season. The Nuggets were seventh in the NBA last season in rebounds, and they should once again be able to clean up on the boards due to their length. Shooting guard Will Barton averaged 5 boards per game as at 6’6″, he is more than just a scoring threat. Denver also has a veteran in power forward Kenneth Faried who knows how to do the dirty work in order to make this team successful, while power forward Mason Plumlee should get plenty of minutes in Malone’s system due to his scrappiness. The schedule makers weren’t kind to the Nuggets to begin the season as they’ll have contests against the Golden State Warriors, Los Angeles Lakers, and New Orleans Pelicans to begin the season, but this team has everything in place to be a force in the Western Conference, while also pushing for a playoff spot. 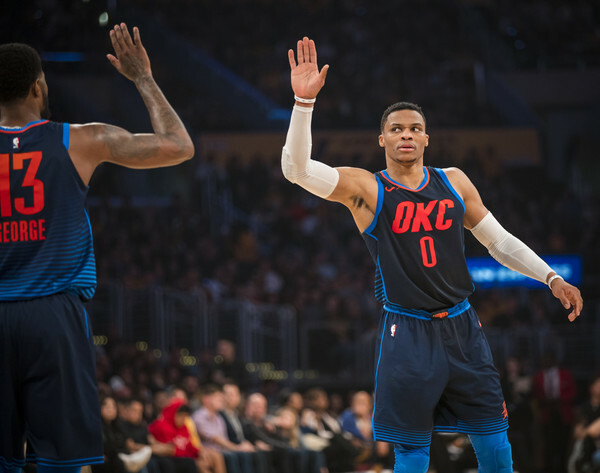 With all of the trials and tribulations that the Oklahoma City Thunder had during the 2017-2018 NBA season, you would have thought that they were one of the worst teams in the league. Prior to the start of the season the Thunder acquired small forward Paul George from the Indiana Pacers and small forward Carmelo Anthony from the New York Knicks. George and Anthony were supposed to be the players to feed off of point guard Russell Westbrook in order to make the Thunder a title contender. However that wasn’t the case for Oklahoma City who did manage to win 48 games and earn a playoff berth, but their trio of stars never meshed. The Thunder were a collective team of individuals as it was all about each player playing for himself and the stat column which is why they ended up getting bumped in the first round of the playoffs by the Utah Jazz. Thunder general manager Sam Presti is a smart person and he saw that this team wasn’t going to work in the long run which led to him trading Anthony to the Atlanta Hawks over the summer. However the Thunder would be able to retain the services of George who after electing to become a free agent last summer decided to remain in Oklahoma City after he and the team came to terms on a a four-year deal for $137 million. Now Westbrook and George are set to become the next duo in Oklahoma City. But will the erratic style of Westbrook, and the laid back personality of George be able to produce an NBA Championship for the Thunder? Make no mistake about it that Westbrook is the engine that makes the Thunder machine go. Westbrook comes into the new NBA season fresh off of being the only player in league history to average a triple-double in consecutive years. But that stat is misleading due to the fact that Westbrook fails to make his teammates better. Westbrook consistently takes the most shots for the Thunder, while he is also a player who needs to possess the basketball in order to be effective. And although that Westbrook will once again be one of the most exciting players in the NBA, his style isn’t efficient enough to win an NBA Title. The best way to sum up George’s game is that he is “silky smooth”. George is a slasher who knows how to get to the basket as he and Westbrook will be a difficult combination to stop in transition. George is 6’9″, but his wingspan makes him 6’11” which gives him an edge as a perimeter defender. George has averaged 1.7 steals for his NBA career, and his ability as a perimeter defender will allow him to compete with the top perimeter players in the Western Conference. But even though that Westbrook and George are good individual players, it will come down to Oklahoma City’s role players for whatever success that this team intends to have. In each of the five NBA seasons for center Steven Adams, his numbers have continued to improve. At 7’0″, Adams can play above the rim, while he also has the ability to play off of both George and Westbrook. Adams is not a player that you can build a team around, but he is someone who could average 15 points and 10 rebounds this season which would be beneficial to Oklahoma City’s cause. There still is not a timetable as to when the Thunder will get shooting guard Andre Roberson back after he suffered a ruptured patellar tendon this past January, but the arrival of point guard Dennis Schroder should be able to somewhat offset his absence. The Thunder were able to acquire Schroder when they traded Anthony to Atlanta, and his presence will help the bench depth of OKC. Schroder is a poor man’s Westbrook who should allow the Thunder’s uptempo offense to not skip a beat when Westbrook heads to the bench. Thunder head coach Billy Donovan has three years under his belt with the team, but he has never been able to replicate the success that this team was able to have in 2016 when they reached the Western Conference Finals. And if the Thunder don’t begin to employ more of a team oriented offense as they were tied for 28th in the NBA last season in assists per game with 21.3, they’ll still be able to do some damage in the regular season, but their flaws will be exposed in the playoffs. The 2017-2018 NBA season saw the Minnesota Timberwolves have the biggest increase in wins from the previous season in the Western Conference. The Timberwolves would win 47 games en route to earning their first playoff berth in 14 years. But even though that the Timberwolves were able to get a taste of playoff basketball, you still got the feeling of what could have been with this team. Minnesota had one of the more talented teams in the NBA, but they were never able to mesh which can be attributed to everyone not being on the same page. Minnesota center Karl-Anthony Towns is one of the most dominant big men in the NBA, but his head coach Tom Thibodeau has him spending too much time on the perimeter. Too many teams in the NBA are falling in love with the notion of making their big men into perimeter players, and in some cases it is taking away from their effectiveness. In the case of Towns, there aren’t too many players who can stop him when he is in the post which is something that Minnesota must get back to. During the 2016-2017 NBA season, Towns averaged 25.1 points per game as opposed to 21.3 per contest last season which can also be attributed to the presence of swingman Jimmy Butler. But even with Butler on this team, Towns should be the number one scoring option for them. In the case of Butler, he was acquired from the Chicago Bulls in the summer of 2017, and he was expected to be a breath of fresh air. Butler was initially drafted by the Bulls in 2011 by Thibeodeau who helped to mold him into one of the better two-way players in the NBA. Butler is one of the better perimeter defenders which gives whatever team that he is playing for a huge edge. But Butler is not a happy camper in the Twin Cities after he turned down and four-year, $100 million extension from the Timberwolves over the summer. At one point Butler was seeking a trade out of Minnesota, but with the Timberwolves wanting a king’s ransom in return for him, it has scared teams off in regards to making deal. Butler reported to the T’Wolves just prior to the end of training camp, and he has all of the symptoms on being an unhappy camper. And if Minnesota’s brain trust is focused on keeping Butler on their roster, he could be dynamite on a short fuse. Small forward Andrew Wiggins is a budding young star for Minnesota, but he has yet to figure out how he and Butler can coexist together. Upon Butler’s arrival last season, Wiggins’ production decreased. Wiggins went from averaging 23.6 points per game in the previous season to tallying 17.7 points per contest last season. Wiggins was not thrilled in regards to taking a reduced role in Minnesota’s offense due to the arrival of Butler, and it is up to Thibodeau to make this work. What the Timberwolves need is to operate an offense that is uptempo, while relying on more ball movement. Both Butler and Wiggins have the ability to get to the basket at will, and once you combine that with the skills of Towns in the paint, there aren’t too many teams in the NBA who can match up with the Timberwolves if everyone is on the same page. Around Minnesota’s “Big Three” there is plenty of talent in place to help this team get it done. Power forward Taj Gibson has always been an underrated role player throughout his NBA career. Gibson is a solid post player who can also knock down the baseline jumper, while also contributing on the boards as he averaged 7.1 rebounds per game last season. Point guard Jeff Teague gives Minnesota another quality ball handler, while former NBA MVP in point guard Derrick Rose could be a diamond in the rough for this team if he is healthy and focused mentally. The Timberwolves have everything in place to be a force in the Western Conference, but their season is going to come down to how the handle the Butler situation as regardless of who is in this roster, everyone needs to be on the same page. Last season the Portland Trail Blazers were able to weave through the traffic in the Western Conference en route to winning the Northwest Division for the first time since 2015, while they entered the postseason as the third seed in the conference. But in the playoffs the Blazers got a rude awakening as they were unceremoniously bounced at the hands of the New Orleans Pelicans in the first round. In losing to the Pelicans, Portland’s backcourt duo of point guard Damian Lillard and shooting guard C.J. McCollum were outplayed by the New Orleans twosome of Rajon Rondo and Jrue Holiday as the veteran guards took them to school. And for the second consecutive year, the Trail Blazers were swept in the first round of the NBA Playoffs. Terry Stotts is set to begin his seventh year as the head coach of Blazers and he has been one of the more successful coaches in franchise history which has seen him transition to building this team around Lillard. But if something doesn’t change in Portland, the Trail Blazers will be one-and-done once again this season in the playoffs. Last year the Blazers were only able to average 19.5 assists per game which was dead last in the NBA. Lillard was able to average a career-high in assists last season at 6.6 per game, but that stat is misleading. Lillard is a point guard by title, but he doesn’t make the players around him better. Too often when the Blazers have the basketball, Lillard and McCollum are playing “buddy ball” as they spend most of the possessions keeping the ball between them. This has resulted in a stagnant offense for the Blazers where Lillard and McCollum are able to fill up the stat sheet, but they are ostracizing their teammates. Aside from Lillard and McCollum, only one Portland player last season averaged more than 10 points per game in scoring which is something that could be remedied if there was more ball movement in the Pacific Northwest. The Trail Blazers have capable players around who can score such as center Jusuf Nurkic, swingman Evan Turner, and power forward Al-Farouq Aminu, but they cannot score if they’re not given the opportunity to produce. This season might not be as smooth as last season for the Blazers due to the fact that this may have not fully gotten over their first-round playoff sweep this past spring. And playing in the Western Conference is not the place to be for any team when they are trying to figure things out.